Winehouse spokesman: "Everyone who is involved with Amy is shocked and devastated"
How can someone so talented be so self destructive? Tune in to "Dr. Drew" on HLN Monday night at 9 ET for a look into the life of Amy Winehouse. (CNN) -- Singer Amy Winehouse, infamous for erratic public behavior, arrests and drug problems, was found dead at her apartment in London Saturday, police and her publicist confirmed. She was 27. London Police Superintendent Raj Kohli said at this "early stage" of the investigation the death remained "unexplained." "I am aware of reports suggesting this death is the result of a suspected drugs overdose, but I would like to re-emphasise that no post-mortem examination has yet taken place and it would be inappropriate to speculate on the cause of death," Kohli said. Police were called to her Camden Square apartment just after 4 p.m. Saturday in response to report of "a woman found deceased," he said. "On arrival officers found the body of a 27-year-old female who was pronounced dead at the scene," he said. She was later identified as Winehouse. Winehouse spokesman Chris Goodman confirmed her death for CNN Saturday. "Everyone who is involved with Amy is shocked and devastated," Goodman said. "Our thoughts are with her family and friends. The family will issue a statement when ready." The "Rehab" singer had a history of battling drugs and alcohol and recently left a British rehab program that a representative said was intended to prepare her for scheduled European concerts. But she cut short the European concert tour last month following a concert in Belgrade, where she staggered around the stage and stumbled through several songs. 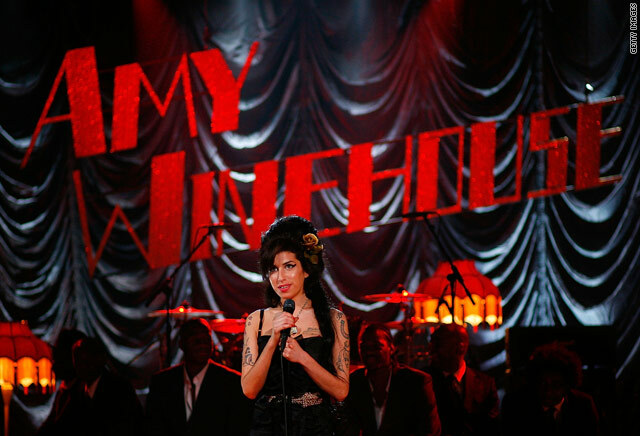 Audience members booed Winehouse off the stage that night just a few songs into the concert, the first of the tour. Winehouse spokeswoman Tracey Miller told CNN at the time that the singer "agreed with management that she cannot perform to the best of her ability and will return home." "Everyone involved wishes to do everything they can to help her return to her best and she will be given as long as it takes for this to happen," representative Chris Goodman said in a statement in May. A new, but almost identical, similar statement appeared on her website Saturday, saying "Amy Winehouse is withdrawing from all scheduled performances." None of her representatives immediately responded to CNN requests for comment. Winehouse's soulful, throaty vocals brought the British musician stardom in 2007, but her off-stage life gained her notoriety. The lyrics of her songs, especially the hit "Rehab," chronicled her troubled life. The song, in which she sang "They tried to make me go to rehab, I said no, no, no," helped form the public's view of Winehouse. "I don't care enough about what people think of me to conform to anything," she said in a 2007 CNN interview. Winehouse, born in London in 1983, became a picture of a tattooed teenage rebel after she was expelled from a prestigious performing arts school. Her first album, "Frank," debuted in 2003, when the singer-songwriter was 19.
International success came with her 2007 album "Back To Black," which included the single "Rehab." She dominated the 2008 Grammys, winning five awards that night and delivering, via satellite from London, a strong performance of "Rehab." Winehouse's volatile marriage to Blake Fielder-Civil took a toll on the singer's career. The couple divorced in 2009 after a stormy two years filled by drug addiction and arrests. Winehouse's parents went public with their efforts to help their daughter, telling the London Telegraph in 2009 that she was on the road to recovery. "A gradual recovery, which is good," Winehouse's father, Mitch, told the Telegraph. "With slight backward steps -- not drug backward steps, more drink backward steps if you follow my drift. I think that will be the pattern of recovery." Her father got word of his daughter's death Saturday while in New York preparing for a Monday night show with his band at the Blue Note club, his publicist said. He immediately canceled the performance and caught a flight back to London, the publicist said. The organization that awards the Grammys issued a statement Saturday calling Winehouse "a dynamic performer and musician who seamlessly blended rock, jazz, pop, and soul and created a sound all her own." "Her rich, soulful and unique voice reflected her honest songwriting and earned her a devoted fan following, critical acclaim, and the genuine respect and admiration of her musical peers," the Recording Academy statement said. "She will forever be remembered for her immense talent, and her music will live on for generations to come. Our deepest sympathies go out to her family, friends, and fans during this difficult time." CNN's Bharati Naik and Denise Quan contributed to this report.